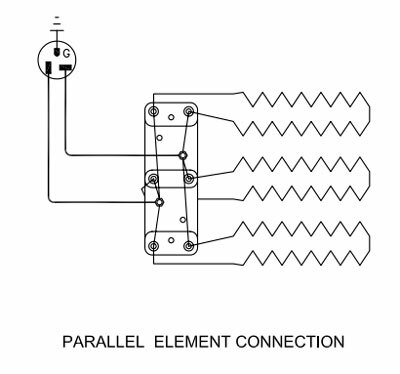 Err1 or Err8 can mean either you need new elements or a new component in one of the circuits. A Paper Test, an Ohms Test and a Voltage test can tell you which it is. Some or all of the elements may be worn out. You may notice slower and slower firing over time, with bisques still ok, no clicking at the top temperatures and uneven results. E- d codes are possible too. Element(s) out- broken inside the kiln, look for damage or perform a paper test. If you recently changed locations, power supplies, elements, or did any repairs, then closely examine what changed between your last successful firing and this one. There may be some other issue besides bad elements or a bad component. A new location can mean a 208 volt power supply rather than a 240 volt supply (about 25% less power). Wrong voltage power- These cases are usually a school that has a 240 volt kiln. 99 out of 100 schools run on 208 volts not 240 volts. In re-wiring the power supply you may not have used thick enough copper wire (line, conduit and connection points will be very hot). If you rewire anything improperly or incorrectly the potential for anything from a blown breaker to just no power at all is possible. (Using wire with a temperature rating of less than 150°F can seriously limit the life of the circuitry and can be dangerous as well, especially when the wires are close to the kiln. 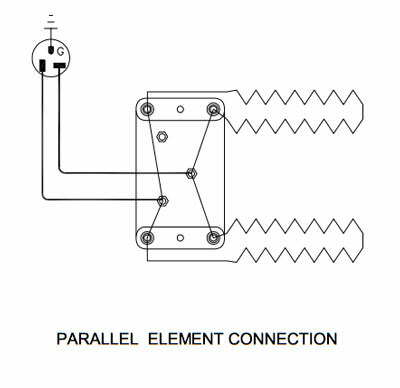 Use a wire diagram and trace every wire to check yourself). You can buy high temperature wire from L&L. Power cord is overheating in the outlet/ up against the side of the kiln or some other connection point is overheating, this can always be seen- will look overheated and will be hot when kiln has been on for a while. Voltage test near the elements will show this too. 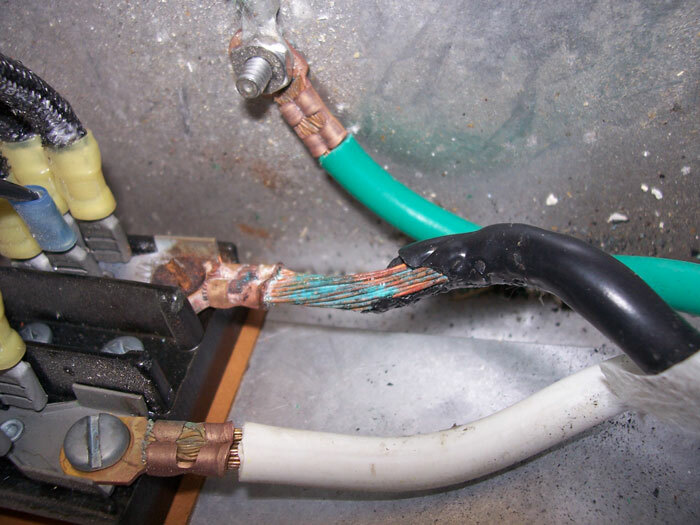 Summertime voltage, or just poor voltage in general, can be from wrong sized wire or too long a run. This problem is compounded by longer and longer firings as elements prematurely age. 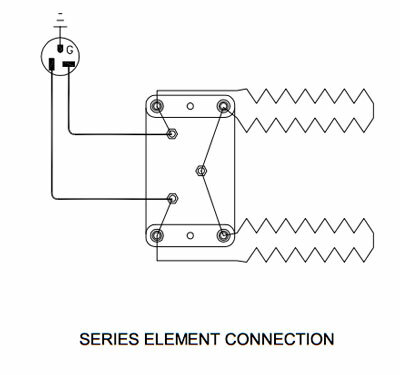 The gauge of the hookup wire is not large enough which creates a voltage drop and reduces power to the kiln. See this link for more information. Check out the thermocouples. When they wear out they often don't read accurately at high temperatures, which can produce an Error 1 code. Thermocouples reading unevenly (from age or loading unevenly or too close to the thermocouple). Loading may be uneven- try putting two elements between the bottom two shelves and add more mass to the upper areas in the kiln. DaVinci/ Handheld only- Check Handheld 14-pin connector for poor connection. Wiggle the connection point carefully while running the kiln and listen for relays to correspondingly go off and on as you wiggle it. Sometimes you will get an E-1 at a low temperature due to the confluence of several variables. The first possibility from is that the kiln's load is uneven relative to the element heating zones and their thermocouples. This especially if the bottom is loaded heavily compared to the top. Be sure the bottom shelf of the kiln is under the bottom element and up on at least 1/2" tall posts. Then use 8" posts to place the next shelf high enough to allow two elements (or bottom 3 elements if your kiln has 3 elements in the bottom section) to shine into the bottom area of the kiln. The second possibility is that there is something too close to a thermocouple in one kiln section, but not in another. Try to keep everything at least 1" from a thermocouple. The third possibility is perhaps a result of the way the kiln acts normally at low temperatures. Because of the thermocouple protection tubes, a change in temperature does not affect the thermocouple in the tube for a few seconds. During that few seconds, until the change of temperature is felt by the thermocouple in the tube, the kiln continues to heat. Normally this matters very little. All it does is make the firing little jerky at first. It will rise a few degrees, wait for the set point, rise a few more degrees, wait, rise, wait etc. The hotter it gets the more it rises and the less it waits. It is rare for any one of these variables to cause E-1 by itself, but when these variables get together it is possible for the kiln to climb slower than 12 degrees per hour for 22 minutes while waiting for the set point to catch up at low temperatures- and that is where you can get E-1. 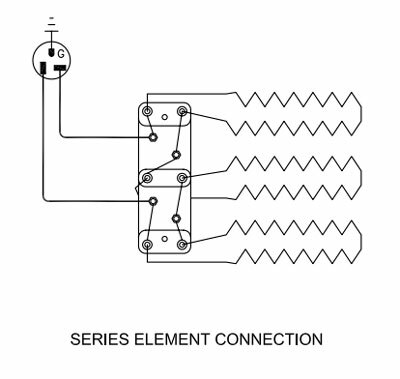 E-1 at a low temperature will sometimes be proceeded by one of the thermocouple readings lagging behind the others. Try to be sure about the loading and perhaps- if it is OK for the clay- try a Fast Bisque instead. Usually E-1 at low temperatures will not happen on faster programs because the kiln is spending more time heating and the set point is rising faster. Reseat the plug. Pull it out of the receptacle and put it back it. This will reseat the connections. 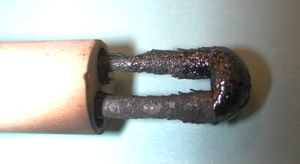 Also, sometimes the female socket and/or the male spades get oxidized (which can resist the flow of electricity). Reseating them can disturb this oxide layer. When you do this examine the plugs for any signs of burning or overheating. If the spades look oxidized you can rub them with steel wool to shine them. Make sure the plug is held firmly and that the springs inside the receptacle seem to be working. Look for any damage on the cord itself. Make sure the cord is not touching the kiln case. CAUTION: This test should only be done by an experienced person familiar with electricity and its dangers. Fix lid seal if a bright red glow is visible around the seal when kiln is operating and/or excessive heat loss can be felt around seal. Rub seal high points down with sandpaper until no more than 1/16 of an inch gap is found at any point along seal. Check for unevenness in the gap that will cause an excessive heat loss. Replace lid if it is excessively cracked or worn or has holes in it. Replace lid. Lightly stuff non-RCF ceramic fiber in the element holes from inside the kiln using a sharp tool like a very small screw driver.